Grave Encounters was a found-footage horror phenomenon that many people believed was just a movie. 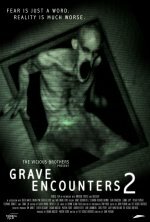 Film student Alex Wright is out to prove them wrong in Grave Encounters 2. Alex is as obsessed with the first film as the 20 million people who viewed ... show all its viral trailer on YouTube. While he and his friends research the events and visit the real psychiatric hospital depicted in the original film, they find themselves face-to-face with unspeakable evil, banking on the hope that their knowledge of the original film will help them survive the sequel.